Congratulations Jesse! 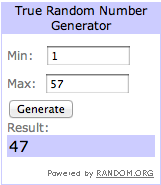 You were “lucky number” 47! Thank for sharing your favorite Anne Taintor quote with us. It’s a good one! You’ll be receiving the Berry Box Journal in the mail shortly. Thank you to everyone for participating and be sure to stay tuned! There are always more giveaways in the works. In addition, if you haven’t already done so, please consider becoming a fan of Erin Cooks on Facebook and you can always follow my random ramblings on Twitter via @GirlieErin. This is soooo exciting! I am so happy. Thanks for the fun giveaway – I feel so lucky to be receiving such a thoughtful and wonderful gift. The past month has been pretty trying in my family and we have had a lot of not so good things happen… and I am looking forward to a turn around and I have been sending out lots of happy positive thoughts. Thank you for helping to brighten my day!!! So happy to have been able to help cheer you up in any little way! I’m planning to mail the package tomorrow. You should have it by Monday or Tuesday (since you’re in the same state as me).